“Lean” – a term that arose in the manufacturing world to describe a process that resulted in fast assembly times, low material waste, high end quality and high volume outputs – was first recognized on the automobile manufacturing line at Toyota in Japan in the late 1980’s. Lean Construction is a forward-thinking approach to building project delivery that applies “lean” principles to the building delivery process, with the goals of maximizing value and minimizing waste. 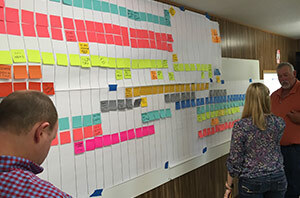 Lean project planning begins with a clear understanding of the owner’s vision and works backward to develop an efficient process for delivery, with an emphasis on well-defined deliverables and tightly managed handoffs between trade specialists. Each step of the delivery process is highly scrutinized in order to identify value and remove waste. The result? A building design process that results in lower initial cost and a more enjoyable experience for all involved. PrayWorks has adopted Lean Construction methodologies and has been applying them with great success to recent client projects. Identifying value from the point of the customer. Understanding the valuestreams by which value is delivered. Achieving flow within work processes as waste is removed. Achieving pull so that nothing is made or delivered until it is needed. Working toward perfection through continual improvement.